L’Occitane products are always high on our list when it comes to fragrance, hand lotion, lip care and shower gel. I was recently invited to try two L’Occitane products from their Immortelle collection: Immortelle Divine Cream and Divine Youth Oil. It’s often been said that you can’t start too young when it comes to keeping your skin youthful in appearance. Until recently, I’ve been on and off with my daily skin care regimen, normally a no-fuss person who likes a little toner and day cream during the day and a good cleanser at night. I wear little to no makeup so I’m a good candidate for test-driving these two products. Both are part of the much larger Immortelle Collection that includes creams, eye balm, night cream, serum, exfoliator, make-up removers and the 28-day Divine Renewal Skin Program. Immortelle Divine Cream comes in a 50 ml (1.7 oz.) golden jar with a golden lid, which when removed reveals a smooth, gently-fragranced cream. 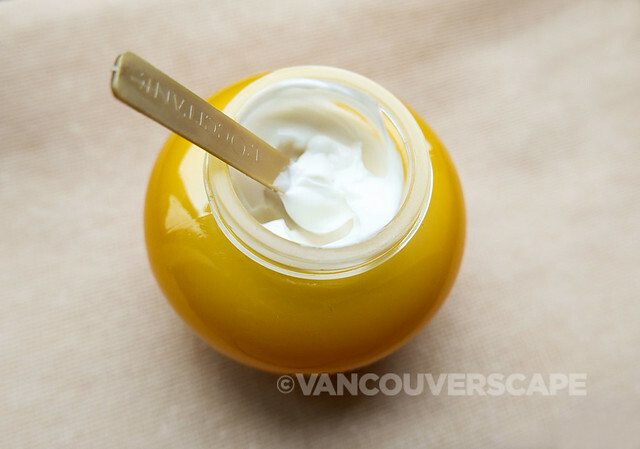 The tiny applicator spoon is meant to scoop up a small amount onto the palm of your hand. L’Occitane’s website includes a video detailing the quiet ritual of using this luxury product. It’s an extremely soft cream that’s gentle on the skin, meant to be used in small quantities. I’ve been using it during the day, switching to the Divine Youth Oil at night before bedtime. Both are meant to visibly correct signs of aging, while firming skin, reducing wrinkles and restoring elasticity. This is L’Occitane’s award-winning signature product (CDN $114) that’s just been granted a fifth patent in France, where the company is headquartered. The lightweight cream contains immortelle flowers picked in Corsica plus seven plant-derived active ingredients. 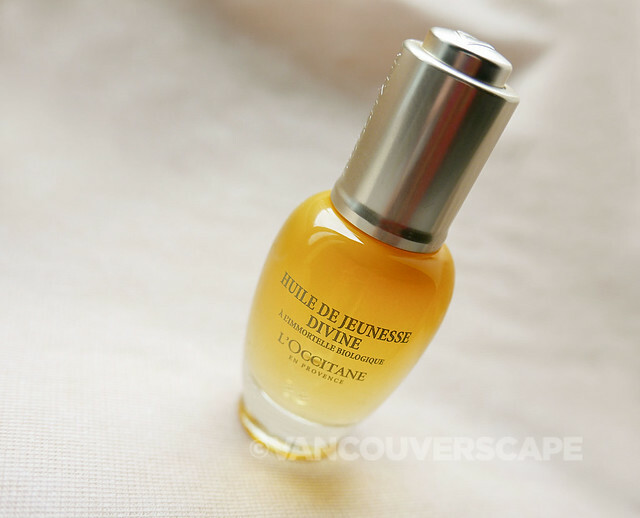 L’Occitane’s Divine Youth Oil (CDN $106) is packaged in a 30 ml (1 oz.) bottle with a golden-topped, built-in glass dropper. To apply the oil (recommended at night), push the top button to release a few drops onto the palm of your hand and warm it by rubbing between the palms, gently massaging onto the face and neck. The oil’s aroma is slightly more concentrated than the cream’s and feels super light on the skin. After using both products for a month (cream during the day, oil at night as mentioned above), I found my skin definitely more hydrated. I wanted to see whether these products would clog my largish pores, particularly on the nose. Did my skin feel firmer, softer, smoother textured? To add dimension to my experience, we were away in Hawaii for a week, and I left both products at home as I’d be lathering on the SPF during the day. Coming back to the morning cream, evening oil schedule allowed my skin a chance to rejuvenate again after the stresses of airline travel, sea water and climate change. I like the soft feel of my skin but there were times that I’d wake up to find it a bit on the dry side, perhaps an effect of the oil. I also tried using just the cream for a week to see how my skin would respond in the morning without it. I’ve now tweaked my skincare regimen to using the cream daily, the youth oil twice a week at night. This seems to be the ideal solution for my particular skin type (normal/slightly oily T-zone). The applicator comes inside the box so once you take it out you’ll have to find a small pouch or spot to store it. If L’Occitane could provide a small cotton pouch to keep it dust-free, that would be the ideal solution. By now you might be questioning why I wouldn’t just do away with a tiny plastic spoon. The pot’s deep, narrow design makes it hard to get at a small amount of cream, so the applicator is actually a handy accessory. Visit L’Occitane Canada online or in Vancouver at 1000 Robson Street for more product info. Unwatermarked photos courtesy of L’Occitane.